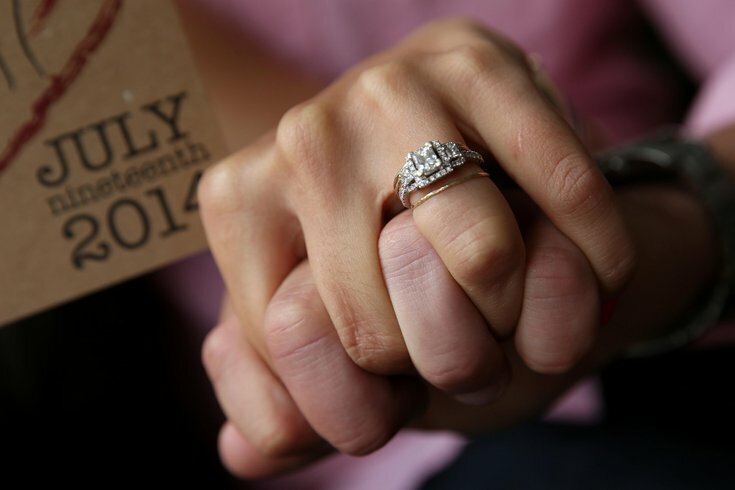 Anthony Spizuoco and Lisette Saavedra hold hands while holding hand-drawn wedding invitations at their apartment in San Francisco on May 31, 2014. The couple plans to marry on July 19 in Portland, Ore., and are sharing the load of attending to wedding details. My solo vocal performance at my sister’s wedding featured guest appearances by snot, tears, and dry heaves. I went into the most important performance of my singing “career” intending to bring other people to tears. Instead, my 8-year-old little body shook as (the now clear) reality hit me: marriage may be the act of uniting, but it requires a separation of sorts. That moment offered an important gem of wisdom and truth: letting go is a form of love too. In fact, it’s an opportunity to explore and redefine what love looks and functions like when roles slightly change right along with last names. Throughout my adulthood, friends and family have gotten married, and every time, my heart filled with joy for their happiness. There were no tears, or snot, or dry heaves (thankfully); nope – just our insider, emotion-filled glimpses and smiles that confirmed: this is really happening. How to be a good unmarried friend to someone who's married. What do I mean by that? In a traditional American marriage, two people make vows to each other. Two. Not the couple and their BFF’s, and parents, and those who are fake happy for them. This means there will likely be a (subtle or not so subtle) change in the dynamic between the unmarried and married friend when it comes to usual routines and discussing certain aspects of life. It’s this point where friendships can wane, for better or worse. The years I spent having to practice the art of letting go recently led to an internal examination of what unmarried friends must be willing to do especially for the family members that they were able to choose (because that’s totally was BFF’s are). 1. Genuinely be happy for them. If you’re harboring some jealousy or selfish thoughts, and unable to separate those feelings from your friend’s happiness and peace of mind, it’s time to take a hard look in the mirror. Your unhappiness is not a license to be a crappy friend. Communicate honestly and together determine the next steps in your friendship. 2. Respect the vows that they took. It’s one thing to repeat the vows. It’s totally different to live them out. They must navigate and learn what their vows look like in real time, on a day-to-day basis. And your best bet, as a friend, is to let them discover this over time. 3. Be present and don't pry. When tough times do come (and they will), be quick to listen and maintain the speed of a sloth when you go to speak. That’s a bit of an exaggeration, but the point is: there may be some things that are now off-limits to discuss until they have been worked out within the marriage (or possibly not at all). Do not pry. Instead, let them know that you’re there and help them find their way by serving as an ear, a shoulder, and sounding board. 4. Accept that you do not and will not know everything. I know, I know: you tell each other everything! Or at least most things. There may be periods where this isn’t the case—you may never get the full story on what exactly is or is not going on. Stay focused on what your responsibility is as a friend (BTW: make sure you’re both on the same page with that) and then go back to number three. 5. Understand their need for space, but don’t entertain excuses. Yes, it takes time to settle in to a marriage—especially in the beginning. It helps to be understanding of this, but if you notice that there seems to be a more permanent change, don’t hesitate to speak up and let love lead the conversation (i.e. pay attention to your tone and your approach to the subject). Chances are they’re not trying to intentionally hurt or neglect you. They’re simply adjusting to this new life. Let them know that you value the friendship and that you want to set a date to link up...with no excuses. 6. Reflect and don't project. Be mindful not to inject your thoughts about what a marriage—especially their marriage—should or should not function like. If you’ve been married and it ended sourly, don’t bring any potential negative views to their positive space. Let them process their marriage through their own filter. If you’ve never been married, encourage them to connect with married couples of all ages so that they can have the best support system and perspective possible, but let them know that you’re here for them, without a doubt. 7. Know it's OK to be vulnerable. If you miss them, say it. If your life is great, share your joy. If your life is crappy, share your frustration, but also identify ways that you plan to change it—don’t just be a complainer. It’s annoying, and eventually, they’ll likely distance themselves from you, Debbie Downer. The bottom line is: friendship is a two-way street and marriage is just a mile marker to remind you both how far you’ve traveled this life journey together. 8. Be committed to the evolution of the friendship. Self-explanatory. There will be moments when it feels like everything has changed and nothing has, all at the same damn time. That’s the beauty of friendship. You two are bearing witness to each other’s life. No matter how many mile markers are passed or where the path may lead, if you both remain committed to the evolution of the friendship and each other, there isn’t a thing to fear or worry about. Here’s to having the courage as an unmarried friend to let go of what was and hold on to what still is, all at once.